DLP: False Sense of Security or a Real Solution? Data Loss Prevention (DLP) is a computer security term referring to systems that enable organizations to reduce the corporate risk of the unintentional disclosure of confidential information. Data-loss prevention of stored data typically involves a Data Security Software installed on your computer to prevent unauthorized access to the data stored on your hard drive and USB/External drives. These systems identify, monitor, and protect confidential data while in use (e.g. endpoint actions), in motion (e.g. network actions), and at rest (e.g. data storage) through deep content inspection, contextual security analysis of transaction (attributes of originator, data object, medium, timing, recipient/destination and so on) and with a centralized management framework. 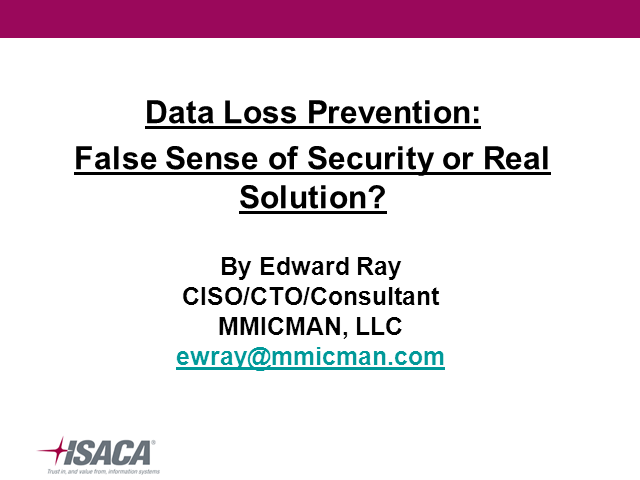 The purpose of this talk is to provide an overview of DLP tools/software and why it is generally ineffective in preventing data loss. Organizations need to establish best practices in addition to (possibly?) deploying DLP to reduce risk of data loss. This talk will include a discussion of these best practices. Title: DLP: False Sense of Security or a Real Solution?